One of the staples in Asian cooking is this Simple Yellow Curry Chicken made with fragrant herbs, spices and Knorr Ginataang Gulay Mix. Try it now! 1 To make the most out of your chicken, frying it in a little bit of oil over high heat until they are lightly brown will give you a more desirable crust and taste. You may also brown the potatoes and carrots if you wish. Transfer chicken and vegetables on a plate then saute onions, ginger and garlic until they are fragrant. 2 Once your aromatics are sauteed, put back pre-fried chicken. Pour in dissolved Knorr Complete Recipe Mix Ginataang Gulay with your vegetables. Now, bring this to a simmer and continue to cook until the chicken and vegetables are tender. 3 Stir in the curry paste until fully dissolved in the sauce. Throw in your bell peppers as well. Simmer until you get that nice thick consistency. Top with slices of leeks just before serving. Simple yet packed full of flavour. 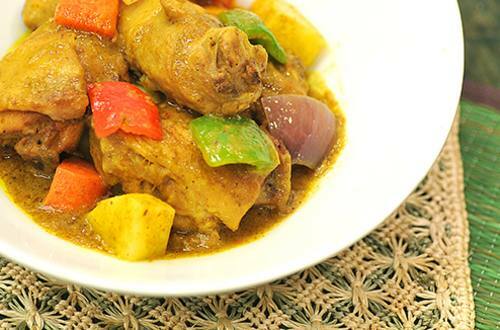 Chicken Curry is one of those comfort dishes that you will always look forward to when coming home.